Great information, very informative. Thanks for the share! Thank you, Tina – glad you stopped by! 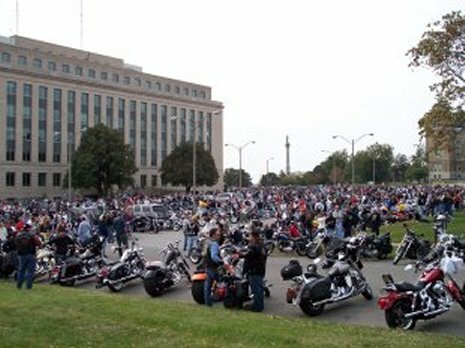 Picture looks like the Toy Run we did several years ago – yes? No? Either way great information and true!! Shirley – Yes it sure is… 2006 :) Thanks for reading and commenting!! My husband is getting a motorcycle. Thanks for the advice about how you can use a parking disc or small piece of wood to prevent your bike from sinking and possible tipping. I think another great idea would be to make sure that when parking in a stall you are far enough out so that a car doesn’t accidentally try to pull in. That is a GREAT tip, Sarah – thanks for sharing it! Yes, if a car doesn’t see your bike in the spot because it’s pulled really far in, it’s possible (even likely, depending on their speed and attention span) they could drive right into the bike! Thanks for adding this to the list!